This past June, while many Canadians were beating the summer heat with a quick dip in a pool, a lake or the ocean, Ali Najmabadi was zipping up his parka to ward off the -20C temperatures waiting outside the Summit Station on the Greenland ice sheet. “And that’s their summer,” said Najmabadi with a chuckle. 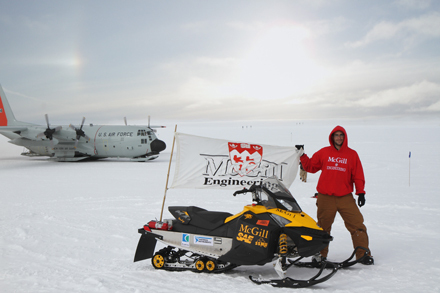 Ali Najmabadi, captain of the McGill Electric Snowmobile Team, and his trusty vehicle Wendigo, at the Summit Station on the Greenland ice sheet earlier this summer. / Photo courtesy of Ali Najmabadi. So what was Najmabadi, who had just finished his undergraduate degree in Electrical Engineering just weeks before, doing at the Summit Station, a scientific research centre perched atop 3,200 metres of ice and nearly 400 km from the nearest point of land? Chaperoning Wendigo, the McGill electrical snowmobile, of course. Najmabadi and Wendigo were invited to Greenland based on the latter’s gold medal performance in the Zero Emission category of the Clean Snowmobile Challenge this past March. Sponsored by the Society of Automotive Engineers, the competition is designed to test snowmobiles for use in extreme Arctic research conditions. But Greenland wasn’t a sightseeing junket. Arriving aboard a U.S. Air Force C-130 Hercules transport aircraft, the snowmobile was immediately pressed into service. This marks the third time McGill has sent an electric snowmobile to the Summit Station and, since the program’s inception in 2005, the Electric Snowmobile Team has had vehicles recruited to do everything from tote recyclables down from the slopes at the 2009 FIS World Alpine Ski Championship in Val d’Isère, France, to carry the Olympic torch at the 2010 Winter Games in Whistler, B.C. According to Cyrille Goldstein, a fourth-year Mechanical Engineering undergrad and a member of the Electric Snowmobile Team, the project is a great opportunity for engineering students to apply principles learned in the classroom to a real life scenario because it provides them with the practical engineering and project management experiences that will greatly benefit them in their future careers. “It’s an invaluable learning experience because we’re not just copying something that already exists, we’re building new things,” said Goldstein. “We build the lithium ion battery pack from scratch. We take individual cells and build a case for it, build the structure and design all the wiring and electrical architecture that controls the pack and keeps it safe.